In this post I will provide step by step instructions to connect your GNS3 install to a physical network and to connect to the internet. 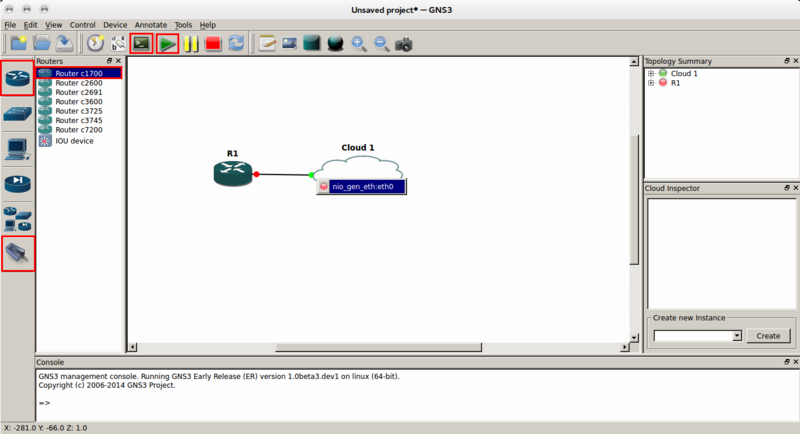 There are two possible methods to connect GNS3 to the internet, depending on the setup of your local network. The first method would be used if your PC is directly connected to your broadband router with a cable (i.e. a wired network). The second method is used if your PC is connected to your broadband router via WiFi, this requires the installation of some additional software and setting up NAT. This the easiest method to get working, it assumes that the Ethernet interface has a private IP address assigned to it either Manually or via DHCP. 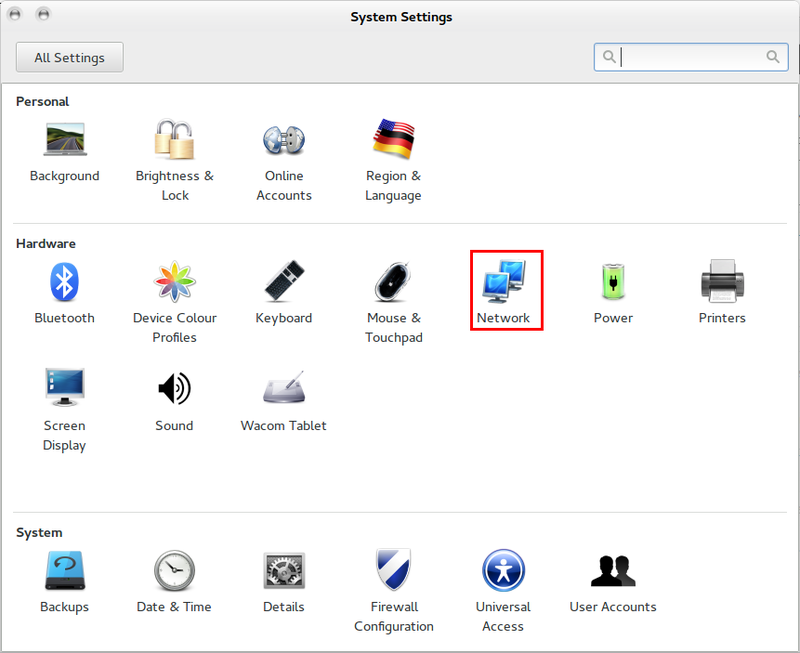 GNS3 must be run as root so that it will have root access to the physical interface on the PC. In order to run the GNS3 gui as root we need to install gksu, which is a GTK+ front end to su and sudo, This allows you to launch GUI applications as root or a specified user. Next select the cloud you are configuring from the cloud group. From the drop down menu, under the NIO “Ethernet tab”, select your Ethernet interface. Click add and you will see the interface appear as nio_gen_eth:eth0 in the section bellow the drop down menu. Click “Apply” and “Ok” and the cloud is configured to use your Ethernet interface. Once your router has booted it is time to configure the router interface to be in the same subnet as your Ethernet interface. This can be done either using DHCP which will be assigned by your broadband router, or Manually using an unused IP address from the subnet configured on your broadband router. conf t ! interface fastEthernet 0/0 ! ip address dhcp ! no shutdown ! end ! conf t ! interface fastethernet 0/0 ip address 192.168.1.123 255.255.255.0 no shutdown ! exit !
! ip route 0.0.0.0 0.0.0.0 192.168.1.254 ! 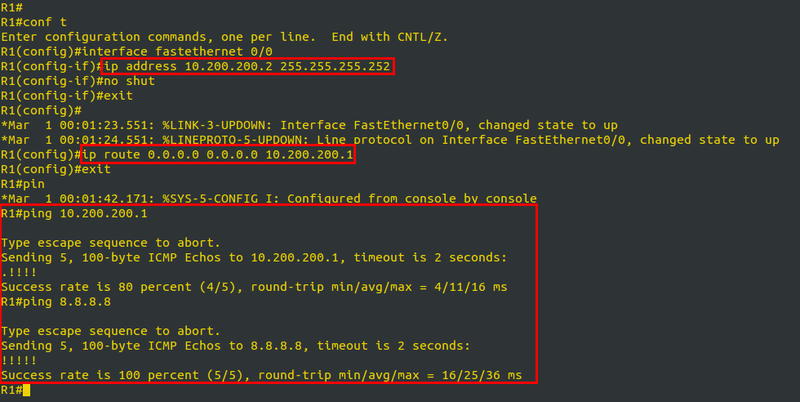 If your PC is connected to your broadband router using WiFi, or you are using a PPP interface on your machine to connect to the internet, you will not be able to use the first method described in this post. For a WiFi connection you will not be able to connect directly to the WLAN interface on your PC because WiFi is secured and usually uses WEP/WPA to connect to the AP. 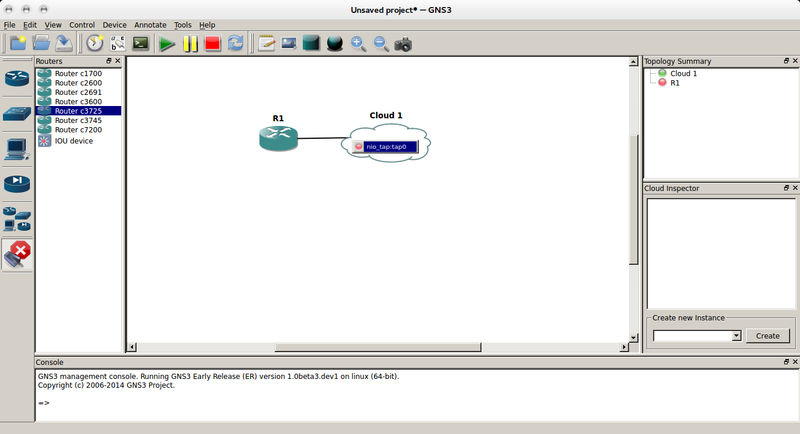 In the case of a PPP interface, you are usually assigned a single public IP address by your service provider and therefore you wont have a spare IP to assign to the router interface in GNS3. To overcome these limitation, we will use a TUN/TAP interface configured on the PC. A TUN/TAP interface is a software only interface (virtual interface). This means they have no physical hardware component (eg Ethernet NIC)and only exist within the Kernel. The kernel will forward any traffic destined to the TUN/TAP interface as if it were actually a physical NIC. 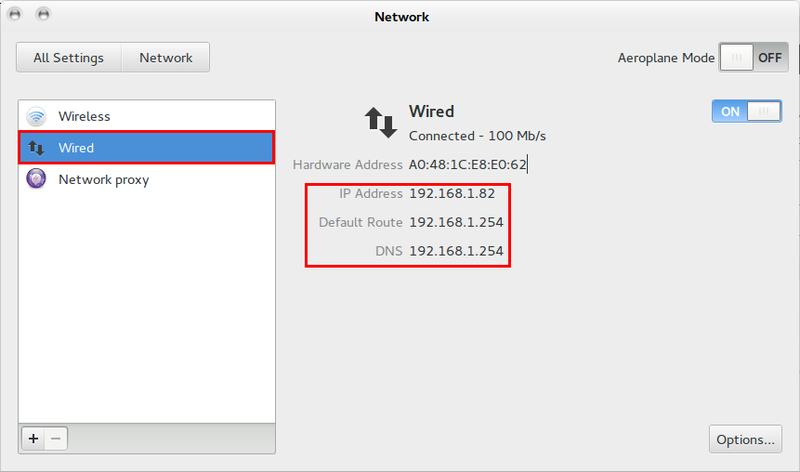 Therefore when we assign the TUN/TAP interface within GNS3 the router connecting to the TUN/TAP will believe it is physically connected to a Ethernet NIC. To make the tap0 interface persistent we have to configure crontab to configure the interface during start up. To make the iptables rules for NAT persistent we have to save the rules to a file and then configure the interfaces to apply the rules on startup. 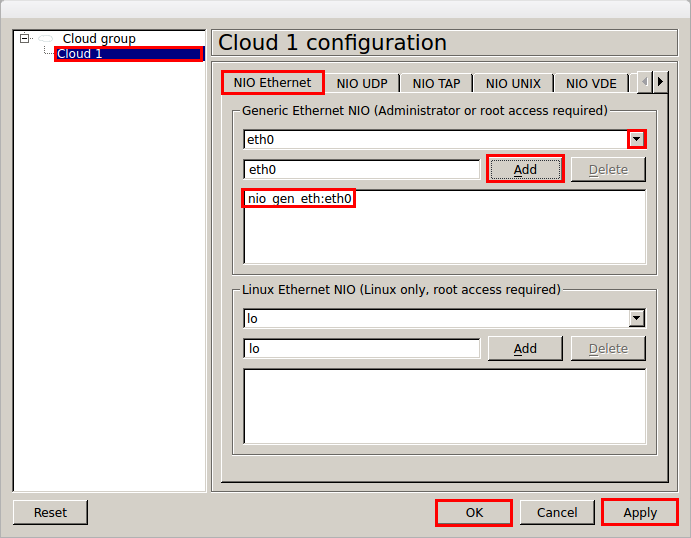 Now we can open GNS3 and add a cloud as previously describe, except this time we will click on the NIO TAP tab. 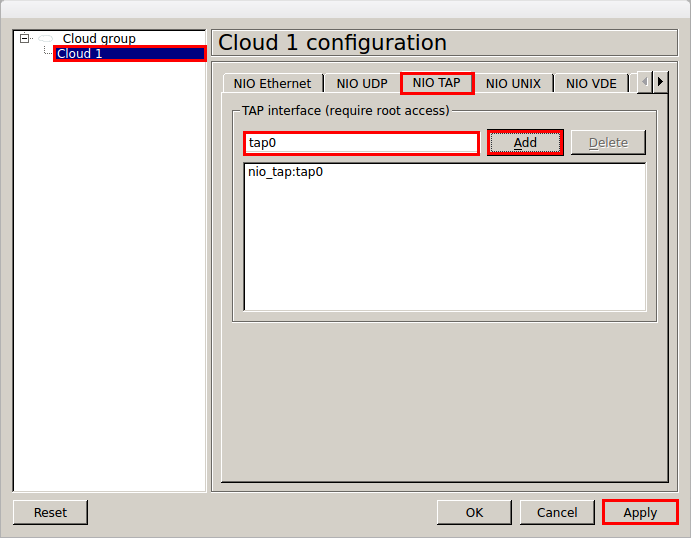 Specify tap0 as the TAP interface and add it to the config. Click “Apply” and then click “Ok”. conf t ! interface fastethernet 0/0 ! ip address 10.200.200.2 255.255.255.252 ! no shutdown ! exit ! ip route 0.0.0.0 0.0.0.0 10.200.200.1 ! end ! I can’t ping the public ip addresses like 8.8.8.8 from gns3 but my pc 10.200.200.1 can ping 10.200.200.2 and vice verse any help please? Sounds like either your firewall is blocking the traffic or NAT is not working correctly. make sure that you have a default route configured on the Cisco device pointing to the IP of the tap0 interface on your PC. 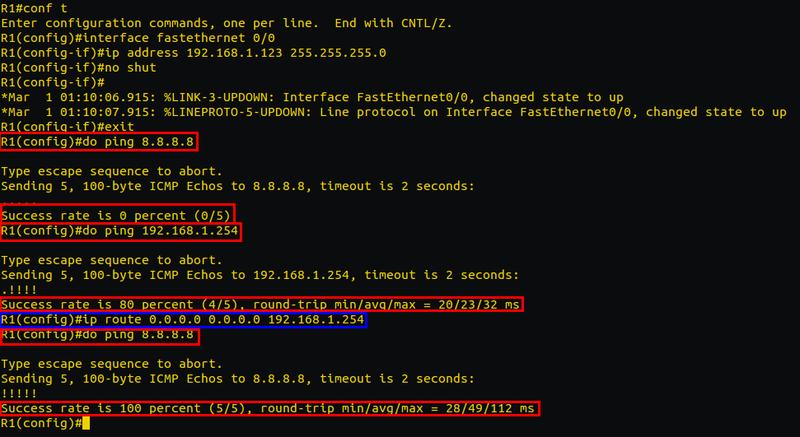 Also please make sure that the router config has a default route pointing to 10.200.200.1 i.e. I have also updated the post as I picked up a couple of copy and paste errors when I looked through it again. Superb guide – thank you very much. And kudos to you for providing references too. It worked first time for me so now I shall look up those references and make sure I understand exactly how it works. Thank you again.